As I explained in my last post, spending a week in the little town of Panyebar, Guatemala recently was a little like a family reunion. 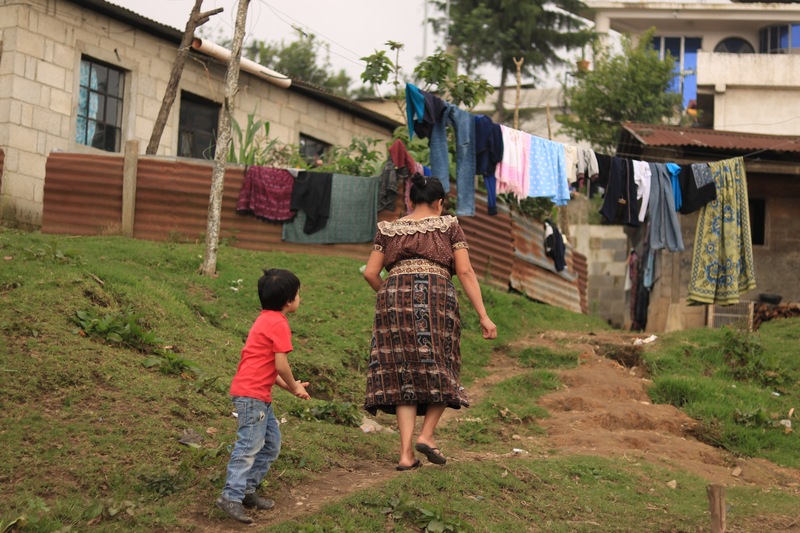 Our “family” of Mayan Partners supporters, ages 7 to 50+, joined a group of Guatemalans of all ages, and the results were lovely and heart-warming. Like any family though, there are complex dynamics at work and some situations feel so fluid and unresolved you can only let go and let God (hopefully) direct. First, I’ll start with the heart-warming interactions. 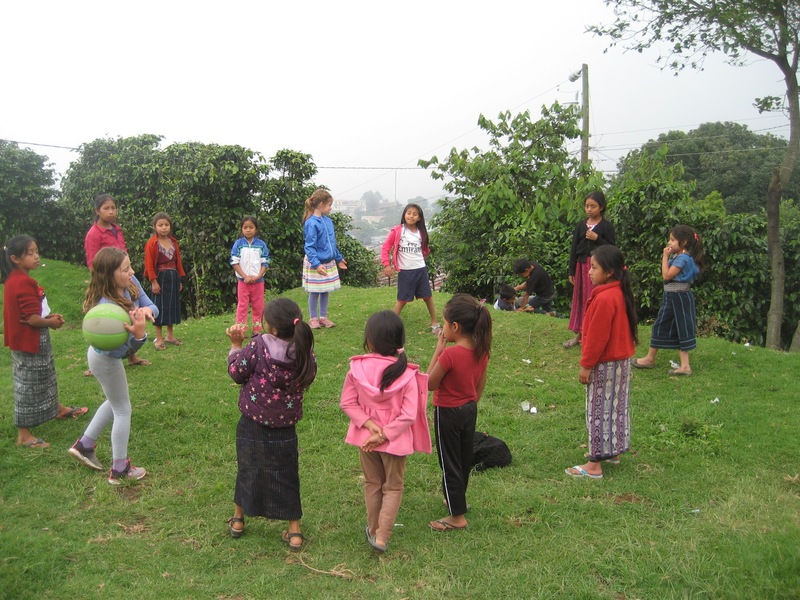 The kids in our group took no time at all to relate to the Guatemalan kids, despite language and cultural barriers. They played basketball and soccer and endless games of duck, duck, goose. They helped out when we painted the basketball court and made crafts with the preschoolers. I’ll never forget seeing my big 16-year-old TJ and his friend Sammy, also 16, sitting on the tiny preschool chairs helping the little kids draw animals. Between them, they came up with the Spanish words for rabbit, cow, and butterfly as they talked about the pictures. 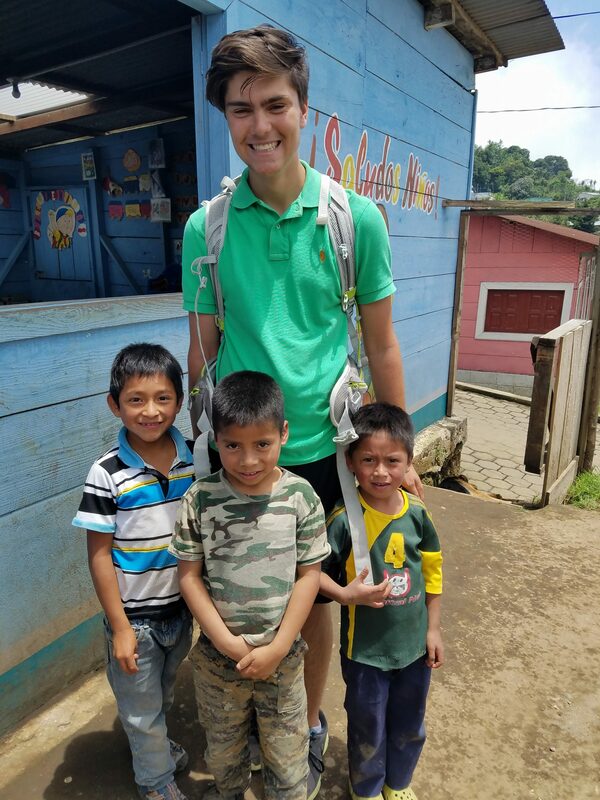 The little Guatemalan kids thought it was hilarious that Sammy had the same name as one of them. They kept repeating Sammy’s full name: “Samuel Heller, Samuel Heller…” and they laughed and laughed. 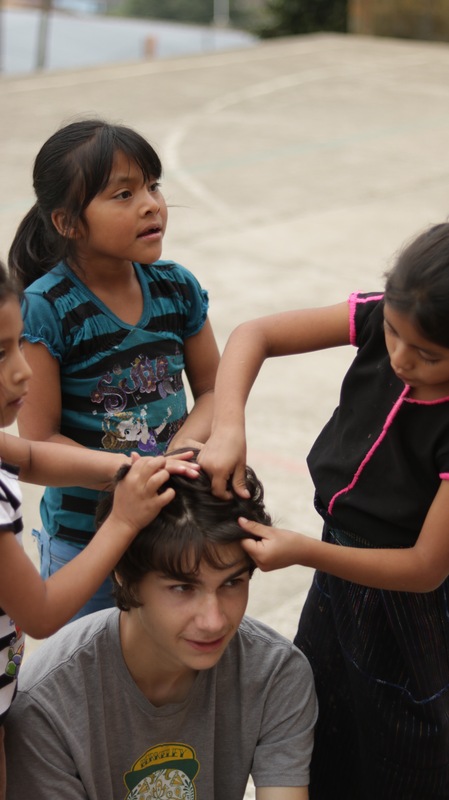 Another comical moment came when the middle school girls in the village decided to braid my boys’ hair. Starting the first day, the girls crafted intricate braids in the hair of the girls in our group. Then, the second day, they turned to the boys. Their hair was just long enough to pull into tiny braids. The very next day, TJ decided that if his hair was long enough for braids, he needed a haircut. He asked one of the villagers where to get a haircut and someone led him down the road to the one barber in town. He got the cheapest haircut of his life: $1. 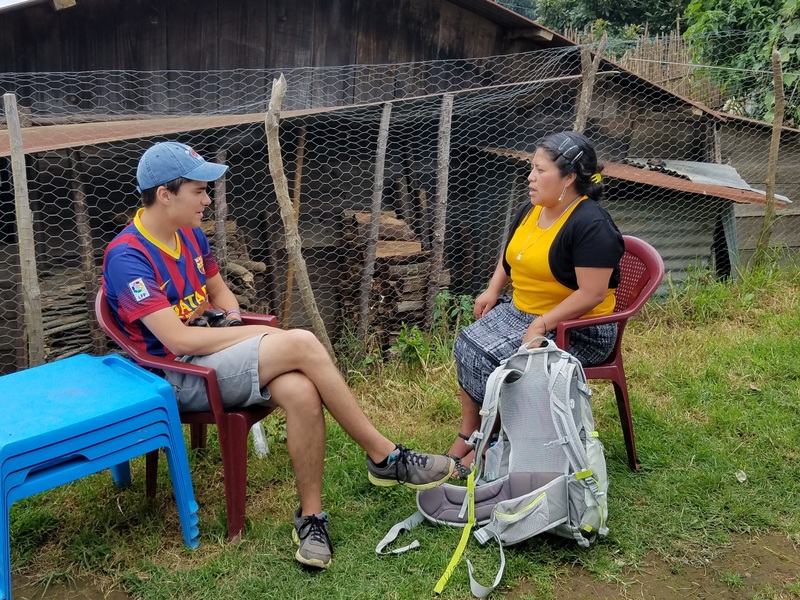 Beyond the laughter and joy, which dominated most of our interactions, there were other situations which reflect the complexities of rural Guatemala and our desire to be friends and not merely rich American cousins. 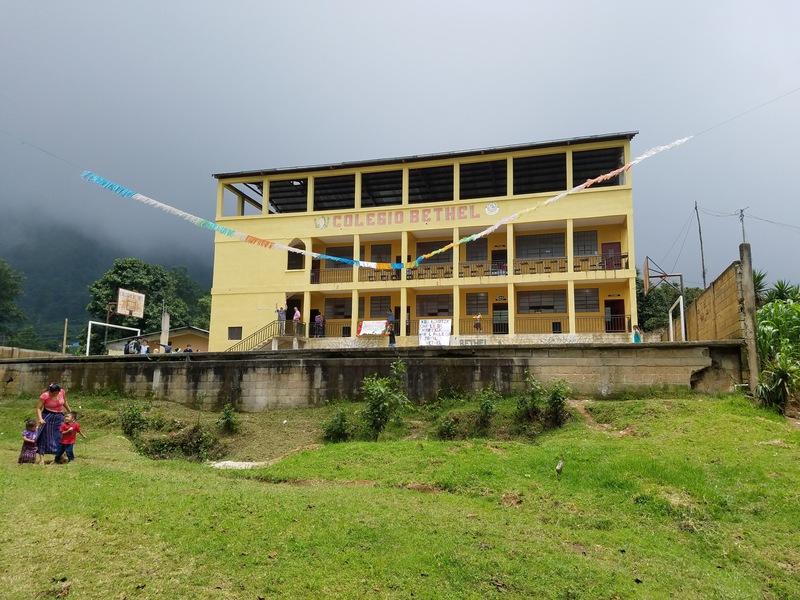 The first day we arrived, after enjoying a festive parade and welcome ceremony, some of us climbed up to the newly completed third story of the middle school and enjoyed a breathtaking view of the village below, surrounded by lush mountains and fields. One of the teachers introduced herself. She was wearing a traditional colorful Guatemalan outfit with a feature some better-off women now sport—a smartphone tucked into her wide faja (belt). She quickly told us her dream was to live in America and work as a Spanish teacher. She is single and wants a better life for her daughter. She had tried twice to apply for a visa but had been turned down. She wondered if any of us had a WhatsApp account so she could write to us. I hesitated a bit, but gave her my address, wondering what I could really do for her. I wouldn’t want to cultivate false hopes. I have no idea how to apply for a visa, and even if she got one, I imagined making it in America would be pretty tough. Was it really worth it to leave this beautiful place? Then again, the job opportunities are so limited here, people are very poor and the village is isolated. The school is one of the only employers in town. I haven’t heard from her yet but maybe someday I will. Another situation that left me somewhat confused happened with a former employee of the school, a woman named Flory. Flory had been a secretary at the school until a few years ago when our group and local leaders decided to implement a policy to eliminate nepotism, which had caused some problems. (Flory is the daughter-in-law of the head of the local committee that runs the school. Her husband Feric and some other teachers also had to leave the school because of the nepotism rule.) Our group reached out to Flory after she lost her job and asked her to make handicrafts for sale in the U.S. as a way to earn income. For two years, she and a group of other women made Christmas ornaments that we sold. We sent many e-mails back and forth to coordinate. Then, this year, I stopped hearing from Flory. My many e-mails went unanswered. What had happened? Our second day in Panyebar, two of us went to Flory’s house but only found Feric, working hard behind a huge loom. It turned out that since losing his job at the school he turned to the only other industry in the village besides farming, which is weaving cloth. He said Flory was out but would be glad to speak to us and we arranged to meet with her the next day. The next day came and Flory received us in a friendly way, but seemed a bit reserved (I later realized this was her personality). She was dressed in a purple hupil (blouse) with matching earrings and a traditional corte (skirt). I asked Flory whether she had gotten my e-mails and she simply said she hadn’t received them (she thought maybe they had been bloqueado–blocked). In any case, she now had a new address. I asked whether she still wanted to make ornaments and she told me a long story about how she now had a part-time job in another town teaching young people to make handicrafts. Finally, though, she said she would very much like to make the ornaments. I was glad to hear this but also felt unsatisfied about our communication. I had hoped for a better explanation. Why had she not written me with her new e-mail address? It’s never easy though to read people’s thoughts or motives, especially when another language and culture is involved. The good news is, Flory and I are now in e-mail communication again. Even better, we had a subsequent good meeting in which took she me around the village to meet the women who make the ornaments. Most are young mothers, caring for small children. One spoke very little Spanish and Flory had to translate my Spanish to Quiche. As Flory and I walked between the houses, on little dirt paths, she told me of several other projects she’s involved in, such as teaching literacy classes in her home and setting up a handicraft center in Panyebar. It’s clear this is a woman with vision. As I reflect more on my interactions with Flory and the other villagers, I realize that most of the people we met in Panyebar did, in fact, have vision. They have dreams and hopes for their lives. In that way, they are no different from us. Just how we Norteamericanos can help them in reaching those visions is an ongoing question. Thankfully, we don’t need to depend on ourselves for all the answers. Like the villagers, we have faith that God will provide and lead. More than anything, our work in Panyebar is a trust-building exercise–with each other and with God. This entry was posted in Spirituality, travel and tagged Guatemala, Mayan Partners, Panyebar by Allison. Bookmark the permalink. A trip of hope I think. Wanting to help but not knowing quite how seems frustrating. Your open, kind heart & prayers have you all in the right position for helping them to come up with some opportunity & solutions. Just realizing you & your group care & are trying to reach out must help them to cope on some level. So great with the pictures too!!! I loved reading the “draft” without the pix but this was better! Thanks for your comments. Hope you get this! 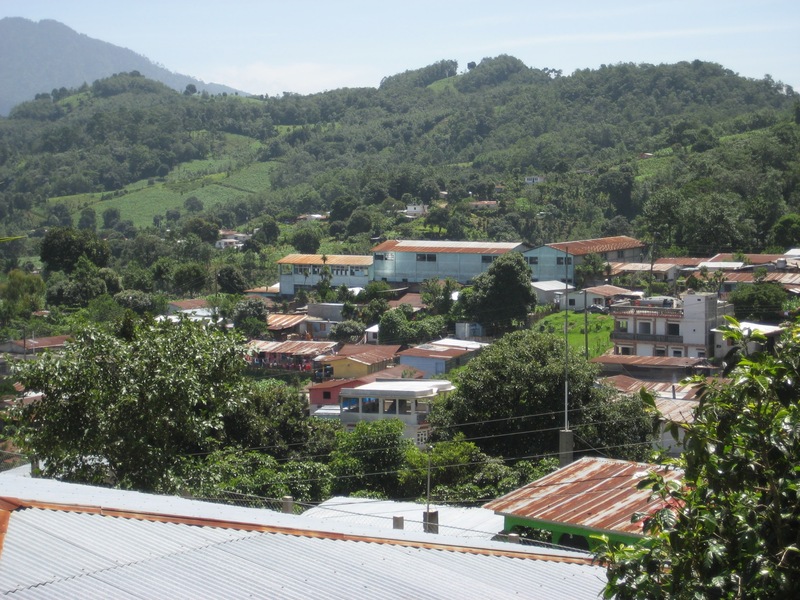 So glad to have found the second part of your trip to Guatemala, Allison… It’s wonderful! And it was exciting to learn that Miguel is planning to do a documentary on his interviews with the women in the town! Keep me posted!